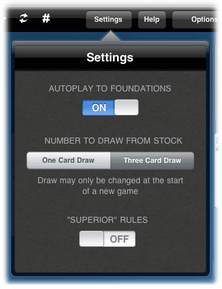 Tap the Settings button to select either one-card or three-card draw before starting play for a new game. Once a game is started, the number to draw cannot be altered without starting a new game. Select the "SUPERIOR" RULES variation before starting play for a new game. The rules variation is in effect if the switch is on. The "SUPERIOR" RULES do not require an empty tableau space to be immediately filled from the reserve. Also, the reserve pile is spread so that all the cards are visible.